The top is 3 hickory slabs joined together with the live edge kept on the outside. The base is reclaimed oak from a local barn. All traditional joinery. nice work love that hickory top,should last a few generations to come. 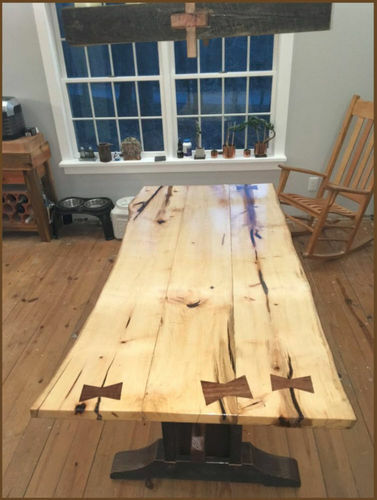 Live edge and wood itself looks just awesome….light coloured wooden table…for a change. Great looking table! Love those Bow Ties! So much too admire here… very nice work! Love the contrast in the hickory top. Do the bow ties serve a function or are they purely aesthetic? Thanks everyone. The bow ties are across splits in the hickory. The splits are filled with epoxy. Pretty heavy duty and very cool. I love the look of hickory. Wish it weren’t so dang hard. I suppose there are applications were that hardness is an asset, but it sure is hard on the tools. Beautiful job on that table.